Palo Alto, California to require EV charging infrastructure in new homes. Should Governments Require Every New Home to Be Wired for Electric-Car Charging? Palo Alto officials say it costs far less to pre-wire a new home for electric-car charging than it does to add that wiring after that house is built. To some, it’s a classic case of liberal big-government overreach. To city officials in Palo Alto—home to Tesla Motors and a longtime electric-vehicle hotspot—it’s common sense. 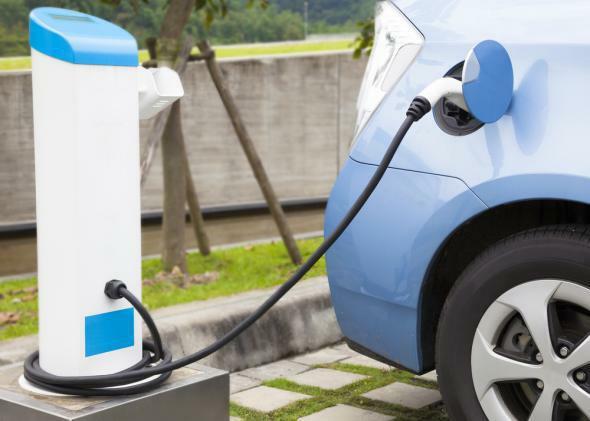 As the Palo Alto Daily News’ Jason Green reported, the Palo Alto City Council voted 9-0 last week to draw up an ordinance requiring every new single-family home to come pre-wired for electric-vehicle chargers. That means adding the necessary circuitry for residents to install a 240-volt “level 2” charging station, as opposed to simply plugging their electric cars into a standard household socket. The former is significantly faster and more efficient. So should it be legally mandated? To conservative critics, policies like Palo Alto’s smack of “picking winners” in the technology industry, rather than letting the free market sort it out. One can imagine how angry liberals would be if some Republican city council mandated that new homes come equipped with the necessary infrastructure for a petroleum gas station in the garage. In fact, though, residential car charging is far more feasible, given that homes already tap into the grid for electricity. Adding the wiring for electric-vehicle charging would tack on only about $200 to the cost of a new single-family home, the city’s staff estimates. In a city where the median home price tops $1.5 million, that’s a vanishingly small sum. And here’s the logic that attracted the city council: It’s much easier to pre-wire a house for electric-car charging than it is to retrofit a house once it’s built. The latter can cost four times as much, and might deter a lot of people from getting an electric car. For a city like Palo Alto, the policy seems to make economic sense. It’s full of residents who want to be green and have money to spare, but lack the appetite for more radical environmentally friendly policies, like high-density housing or public transit infrastructure. If you’re going to keep building single-family homes, a nudge here or there to encourage those homeowners to drive electric cars seems like the least you could do to minimize the environmental impact. Besides, the city’s public charging stations are already in high demand. The proposed ordinance would offload some of the supply burden onto the city’s wealthiest new residents. Meanwhile, as plugincars.com notes, Palo Alto’s ordinance would dovetail with a pair of pending statewide bills that would require similar pre-wiring in new businesses, shopping centers, and apartment complexes. If approved, those would help set up the state to continue to lead the world in electric-vehicle adoption. Already, sales of the pricey Tesla Model S have outstripped those of several other major luxury car makers in California. More affordable plug-in cars like the Nissan Leaf also see their greatest sales figures in California. In the worst-case scenario for Palo Alto and California, demand for electric cars fizzles for some reason, the city and the state will be left with a bunch of charging stations that almost no one uses, and a bunch of homeowners and businesses will have wasted a few hundred bucks. In the best case, electric cars turn out to be the future, gas-guzzlers go the way of the steam locomotive, the air is spared, and California is way ahead of the rest of the country once again. If that happens, the question for local officials in a decade or two might be: What do we do with all of those obsolete gas stations?